Early Autumn literally flies by for this gardener. School starts, spare time is devoted to coaching soccer during the week and in general, life with kids, is just busy. Summer seems slow and mellow by comparison. Despite the endless craze of sports, work and other obligations, our family has found time to harvest the fruits of our summer vegetable garden. By mid August, the heirloom tomatoes were pumping out buckets of toms. We quickly got to work, harvesting and making sauce. We continued to make sauce through September. We used our own fresh herbs to create a unique flavor. It is such a delight to pull a bag of homemade tomato sauce from the freezer in the middle of winter. Thanks to blogging friend, Allison, I am swimming in onions. The Walla Walla's were harvested first and distributed through out the neighborhood to enjoy due to their short storage life. My neighbors were so excited to receive a gift from the garden. 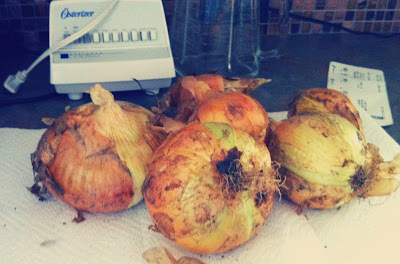 I have another two bags of storage onions in the cellar. I see some fantastic stew and soup making in my future. Our potato harvest was very successful. I planted red and gold potatoes and dedicated a whole raised bed to them. 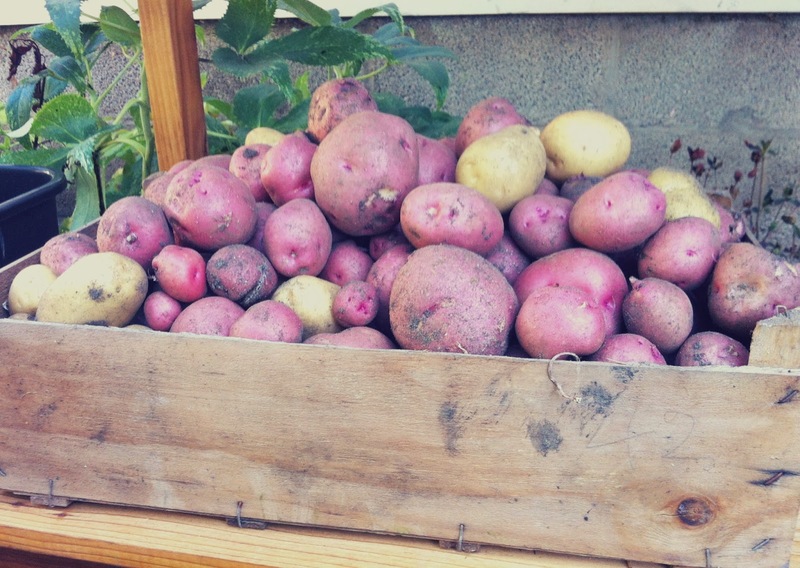 Clearly, we do potatoes right in this garden. Two large bags of potatoes sit in the cellar. We had loads of cucumbers. Too many. The peppers were also successful. Our raspberries pumped out another wave of berries late August and into September. My freezer was already full from the first wave of berries in June, so I let the kids invite their friends over to pick and devour to their hearts content. The final project awaiting me is to roast my pumpkins. I have five cute little sugar pumpkins and they will make delicious pumpkin pies for Thanksgiving. I've found that baking them in the oven and scraping the meat off the rinds is in fact, quite easy and is worth the effort for the incredible taste they provide. I measure and freeze them until its pie making time. I did find it hard this year to juggle the demands of the garden and all the other obligations in life. With our trip oversea's in August, it set me back on my garden related tasks. 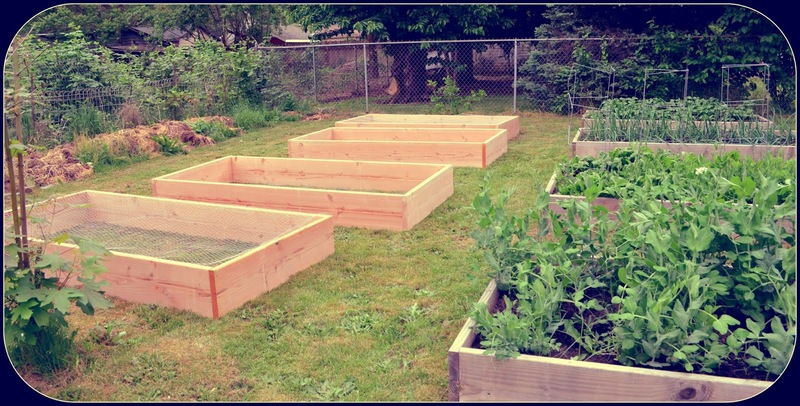 However, I'm looking back at all of our lovely raised garden boxes and I'm proud of what we built in just one year at this new home and garden. Raising a vegetable garden is worth the effort. Learning how to grow my own food, care for soil and beneficial bugs and pass this knowledge on to my children is incredibly rewarding. But, what I enjoy the most of this experience of growing and harvesting food, is the reminder that despite the pull and lure of a fast paced society, living on 'garden time' is a beautiful and gentle pace. To be reminded to watch the skies and temperatures, to care for other living things and breath in the sweet scents of blooms and ripe berries, are some of the delicious delights of co-existing with nature. 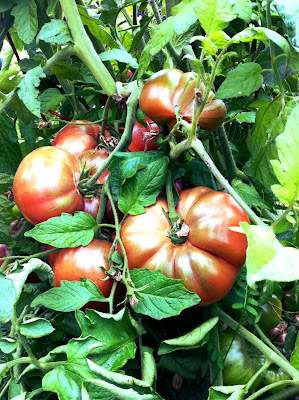 I love watching my efforts of gardening without pesticides or artificial fertilizers, flourish under my care. 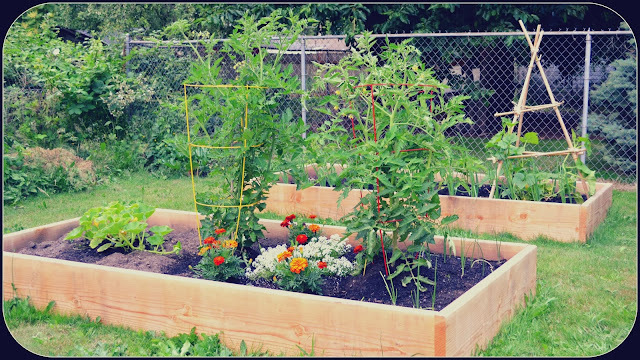 When I educate myself about what plants grow together well, what plants to add to repel the bad bugs and how to rotate my crops in order to keep my soil healthy; I feel pride in my accomplishments. Five years ago, at our previous home, I started gardening with a minimal idea of what I was doing. What an amazing journey my family and I have experienced. 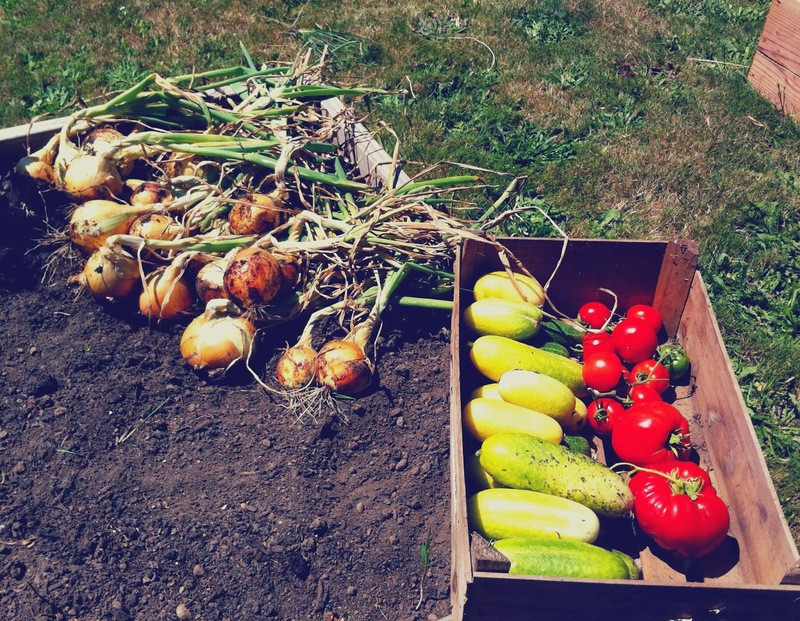 The best part is that my husband has now started to actively help care for the garden and even took over harvesting and saucing the tomatoes this year. That looks like some really delicious sauce! I am so jealous, my tomatoes were not successful this year. I'm impressed with your potatoes too. My potato harvest two years ago was not really worth the effort of growing them. You've grown greatly, too, as a gardener. 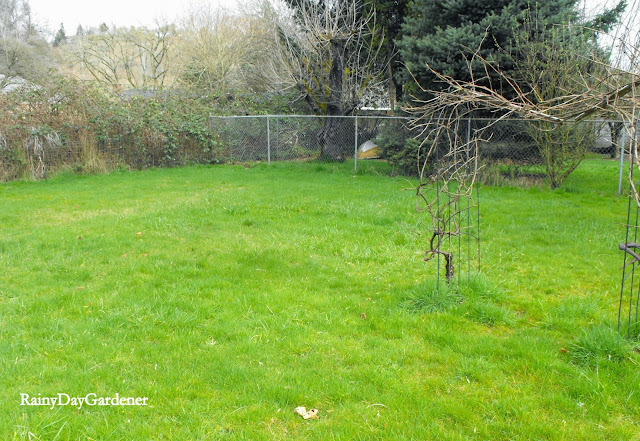 In your post, I can feel the joy you get from gardening and from sharing your love of it with your family. Having a cellar must be a real bonus for storing harvests. I'm impressed by your harvest, but even more by the sentiments you have expressed here. Making a home and making memories is the best gift you can give your children. Not much freezer space here, but the pantry is my own little jewel box. Hi Jenni, At first I thought, "Am I reading this correctly? This is Jenni who just moved to her new house. How is she harvesting all these veggies?" But sure enough it is you. And you're amazing, tackling all of that with an overseas trip and two young children and a hubby to care for. Not to mention all your own endeavors. Successful gardening is about the best feeling one can have and you were indeed a success!